Continuous developments in microscopy have made it possible to produce large numbers of high-resolution cell images. The volume of image data produced makes it necessary for researchers to have a high degree of automated image analysis that in turn leads to an increased demand for tools that allow automated cell image analysis. 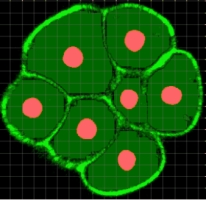 The ImarisCell module allows you to automatically segment, filter and analyze individual cell data in the images featuring clusters of cells. ImarisCell streamlines error-prone and time-consuming manual processes and identifies cellular substructures defined by their morphological features. ImarisCell’s Membrane Detection algorithm enables users to segment and analyze images of cells characterized by their distinct membrane staining. 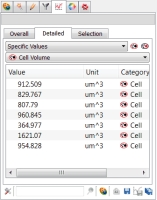 To start the Cell Creation Wizard, first click on the Cell icon . Then, in the Algorithm Setting, select the Cell Membrane algorithm. 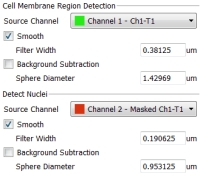 In the next step, the user will define Cell Membrane Region Detection, the source channels and the filter settings. In the absence of a cytoplasmic stain, the nuclei-based detection is an important step. The cell’s segmentation is initiated by segmentation of the channel representing the nuclear stain whereby nuclei are used as spatial reference. The following Threshold step segments the image. Nuclei locations determined in the preceding step are used as seed points for an algorithm performing a cell membrane calculation. 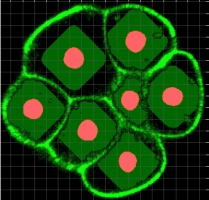 Cell membranes have a certain non-negligible thickness that is utilized by Imaris’ algorithms to distinguish between the inner and outer boundaries of the cell. 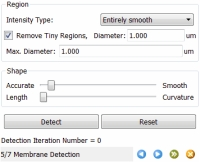 There are two methods for membrane detection; entirely smooth and PieceWise smooth. The entirely smooth algorithm assumes that the membrane signal’s intensities are statistically homogeneous in each region assigned to the image. However, in practice, large objects usually have heterogeneous intensity distribution and this is what the PieceWise smooth algorithm takes into account i.e. the presence of intensity variations in signal intensity. 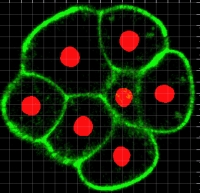 Detected nuclei are used as the initial inner cell region and the size of the cell is then calculated by fitting a closed border around the segmented nucleus objects. After pressing the Detect button, the algorithm starts interactive boundary detection. Computed results are displayed in the viewing area and are readily available for interactive adjustments of detection criteria. Cell membrane algorithms are a collection of automatic tools that can be specifically adjusted with the help of interactive settings. 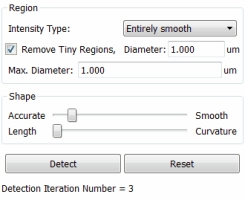 You can direct the algorithm to remove small complex membrane regions by defining their diameter. Also, the shape of the cell membrane can be refined at this stage of the iterative membrane detection process. The user is in full control of it by changing the settings of Accurate/ Smooth and Length /Curvature sliders. The membrane detection process may be repeated by pressing the Detect button until the user is satisfied with the quality of the segmented region. The number of the completed algorithm iterations is displayed as the Detection Iterations Number value. 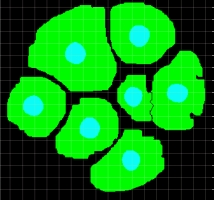 The final result displays accurate segmentation of the cells’ unstained regions. Finally, various, biologically relevant statistical data obtained from the segmented cell can be found in the Statistics tab where advanced filtering and further data extraction and export can be performed.